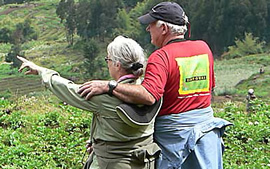 This 5 Day Primates tour in Congo and Rwanda will offer you the opportunity to track the chimpanzees in Nyungwe Forest National Park, colobus monkeys or forest canopy walk and then also track the lowland gorillas in Khauzi Biega National Park. In the morning, you will be picked from your hotel in Kigali and transfer southwards to Nyungwe national park with en route visit to the national museum in Butare, the Murambi genocide memorial site, the Nyanza king’s palace. Dinner and overnight at Nyungwe Forest Lodge (luxury)/ Nyungwe Top View Lodge(Deluxe)/ Gisakura Guest House (budget). After breakfast transfer to the park headquarters and attend a briefing from the park warden on do’s and don’ts while tracking chimps. 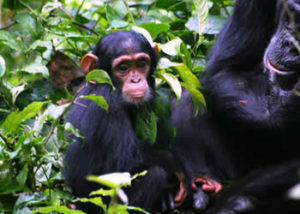 You will then transfer to the starting point of the chimpanzee hiking trail. 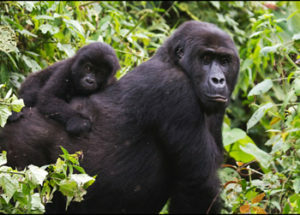 Expect to meet Chimpanzees, black and white colobus monkeys, vervet monkeys, baboons along the trail. Return to the lodge for lunch an later go for Forest Canopy walk or colobus monkey tracking. Dinner and overnight at Nyungwe Forest Lodge (luxury)/ Nyungwe Top View Lodge(Deluxe)/ Gisakura Guest House (budget). Day 3: Transfer to Bukavu- DR Congo.